As well as the ban, FIFA’s ethics judges fined Chiriboga, who has already been convicted in his homeland of money laundering and sentenced to 10 years of house arrest, CHF1 million. 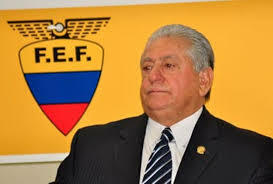 Chiriboga, now 72, took illegal payments in exchange for rights connected to the Copa America and Copa Libertadores. His ban follows the seven-year sanction handed down last week by FIFA to former Guatemalan Football Association president Rafael Salguero. Ecuador has long rejected requests by American prosecutors for Chiriboga, a former member of the CONMEBOL Executive Committee, to stand trial in the United States since there is no extradition agreement between the two countries. Back in November 2017, Chiriboga’s son testified against his father in a New York court, admitting he facilitated bribery payments. Chiriboga testified that his father asked him to use his account at Biscayne Bank in a Miami suburb to receive wire transfers. “It was my father asking. I couldn’t say no,” he said.